The advantages of Culture Collaboratory over existing software are manifold. Its object-centered approach helps researchers to understand and assess complex information in interdisciplinary settings more quickly and easily. Making full use of the potential of data visualization and visual analysis, it allows to see and think in new complexity. Unlike static database systems, Culture Collaboratory is not merely a digital archive of information. Instead it supports interdisciplinary research processes by providing a platform for collaboration and exchange. Following the philosophy of open access to science and culture, an integrated publishing tool makes it easy to share knowledge with the research community and the general public. The layer object employs the physical artifact as a mental model and serves as a matrix on which all research data can be mapped without loosing its context. Moreover, the mental model of the layer object is intellectually accessible to all disciplines and helps researchers to understand their colleagues’ research data and interpretations. The culture genome is a visual notation system that allows to analyze and compare metadata of cultural artifacts. It is generated by overlaying the timelines of the various metadata categories that appear spread out in full view mode. As a thumbnail of all research data associated with one object, the culture genome helps to assess the state of research of individual or multiple objects at one glance. The use of high resolution images or 3D scans allows to perceive materiality in higher detail and clarity than would be possible with the human eye. Culture Collaboratory can be used in a multitude of settings: by teams creating an exhibition or researchers in academic institutions who need to manage and interpret large sets of data. 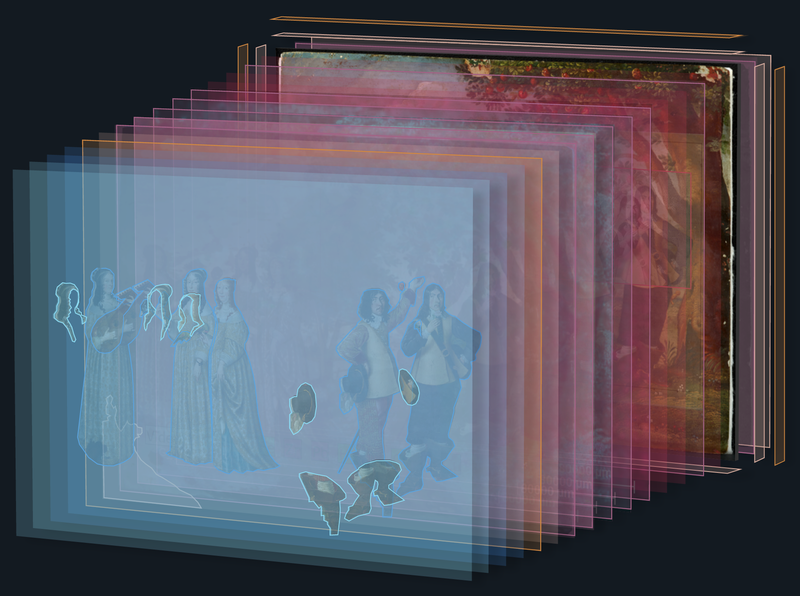 Smaller museums with limited resources benefit from a software that helps them manage, research, and publish their collections. Alternative fields of use include research areas in which object-centered organization and visualization of data will enhance the efficiency and quality of research, for example in the healthcare sector where the conceptual framework could be reinterpreted as a patients management system. Our next step is to transform the designs of Culture Collaboratory into running software. In order to reduce implementation time, we will build software prototypes of its main modules – the layer object and the culture genome. Additionally, we will further develop core functionalities, for example expanding the layer object to include 3D scans of sculpture. Challenges lying ahead will be the implementation of suitable metadata structures and disciplinary thesauri, insuring compatibility with existing collections management software, and performance and efficiency in using big data. We are looking for partners and supporters who want to see Culture Collaboratory come to life.